Diwaka offers a wide selection of Nairobi safaris / excursions. There are half day and full day trips, which take you to the various tourist attractions in and around the capital. Covers the main areas of interest in the capital including the Nairobi National Museum, historic areas such as the Parliament buildings and Mausoleum, and the colorful markets. Traditional homesteads of the better known Kenyan tribes have been beautifully recreated. Entertainment by traditional dancers. 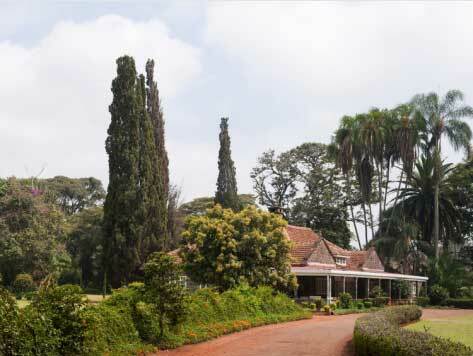 A visit to the Karen Blixen Museum, former home of the authoress of the book Out of Africa. A visit to the Giraffe Center, a sanctuary for the rare and beautiful Rothschild’s Giraffe, Kazuri, a bead and pottery factory and shop for souvenirs at Utamaduni. Situated 7 km from the city center, Nairobi National Park has a large and varied wildlife population including lions, rhinos, buffaloes, giraffes and more than 400 birds species. Optional visit to the adjacent Safari Walk or Animal Orphanage. The Carnivore Restaurant is famous for its succulent steaks – beef, lamb, chicken, and pork cooked Masai style on skewers over huge open pit barbecues. The restaurant does offer a vegetarian menu. Tamarind Restaurant is situated in the heart of the city and serves brilliant seafood. At the Animal Orphanage get to see different animals and their young. The Crocodile Farm is home to ostriches and more than 70 crocodiles. On Sundays you can watch the crocodiles being fed. This excursion offers great insight into the work of Kenyan artists who use traditional African materials and styles to design cloths, jewelry, and sculptures. Places to visit Geminis, Kioko (Mwitki), and Kiko Romeo. Depart from Nairobi at 8.00 a.m. through the breathtaking Mau Escarpment and the Great Rift Valley. After a relaxing time, take a boat ride on Lake Naivasha and visit Crescent Island, Lake Naivasha’s best kept secret. Lunch is at the Lake Naivasha Country Club. In the afternoon visit some carving and weaving workshops. Return to Nairobi at about 5.00 p.m. This Nairobi safari takes you to Lake Nakuru National Park. The park is a birdwatchers paradise and home to over a million flamingos. Wild animals are in abundance including antelopes, buffaloes, rhinos, giraffes etc. Lunch is at a lodge situated inside the game park. The return journey stops at Lake Naivasha for tea among the yellow acacia trees and a spectacular array of birds. Return to Nairobi at about 5.00 p.m. Depart at 8.00 a.m. towards Subukia to arrive at the farm, which is a couple of kilometers from Nakuru town. After a sumptuous tea at the farm visit the Colobus Monkeys Sanctuary – one of the few places where these endangered species can be seen. Later tour the plantation and learn how tea /coffee is grown. After a delicious barbeque lunch, visit a satellite village of the people who work at the farm. Return to Nairobi at about 5.00 p.m.
Dep. Daily at 9:00 a.m.
Panoramic city tour followed by a visit to the Nairobi National Museum, Karen Blixen Museum, the Giraffe Center and the Utamaduni Arts and Craft shop. Lunch at the Ranger’s Restaurant. At 2:00 p.m. visit the Nairobi National Park. Return to the hotel in the evening. Visit the Nairobi National Museum and Snake Park, the Karen Blixen Museum, Giraffe Center and the Utamaduni Arts and Craft shop. In the afternoon, a short visit of the capital of Kenya and possibility of shopping in the Zanzibar Curio Shop, Viking House, and African Heritage. Return to the hotel in the evening. Lunch can be at Toona Tree Restaurant (international cuisine) or at the Tamarind Restaurant (seafood). Game drive at Nairobi National Park followed by lunch at the Carnivore Restaurant, which is next to the park and famed for its succulent steaks. In the afternoon have a relaxed time at the Bomas of Kenya. Experience traditional village life and enjoy the display of traditional dance, music, and song. This tour takes you to the African Heritage Gallery on Mombasa Road, Utamaduni Arts and Craft, Kazuri Beads Cottage industry with lunch at Karen Coffee Garden. In the afternoon visit the Butterfly Farm and Mamba Village. Shop for art, artifacts, woodcarvings, antiquities, jewelry, precious stones, clothes, T-shirts, marble, Indian silks, postcards, calendars, photography, and books. Lunch at the African Heritage on Mombasa Road. Return to hotel after 5.00 p.m.
On Sundays and Public Holidays, only morning or afternoon plus lunch. Visit Kiambethu Estate at Limuru, with lecture on history, a walk in the forest and tea plantation. Lunch at the estate. In the afternoon visit the Riuki Cultural Center learn and experience the folkways of the Kikuyu people, a large Bantu group from Central Kenya. Visit homesteads, sample traditional food and enjoying traditional dances. Return to Nairobi at about 6.00 p.m.
Full day of golfing at the 18-hole championship golf course at the Windsor Golf Hotel & Country Club inclusive of lunch. Use the form below to e-mail your Nairobi safari inquiry to Diwaka Tours and Travel. They normally give you feedback in less than 8 hours if you e-mail them within the working hours (9:00 a.m. to 5:00 p.m. EAT) and in less than 24 hours when you e-mail them outside the working hours.